Krashes are a type of Kremling who drive around in Mine Carts uncontrollably. Krashes have an identical appearance to Kritters, and they first appear in Donkey Kong Country. Klanks are the considerable successor to Krash in both Donkey Kong Country 2: Diddy's Kong Quest and Donkey Kong Land 2. Diddy jumping over a Krash in Mine Cart Carnage. 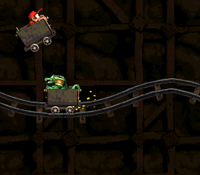 In their debut appearance in Donkey Kong Country, Krashes appear in both Mine Cart levels, Mine Cart Carnage and Mine Cart Madness. In their first level appearance, Krashes ride a Mine Cart in the opposite direction of Donkey and Diddy Kong, and if they ram into the Kongs, the lead one falls out of the Mine Cart. Although Krashes look vulnerable similarly to Kritters, the Kongs cannot jump their Mine Cart onto Krash, as this injures them while the Krash remains unaffected. The Kongs must only avoid Krashes by jumping over them. Krashes make their second and final appearance in Mine Cart Madness. Here, the Kongs jump out of their Mine Carts directly instead of carrying it with them. The Kongs can defeat Krashes very similarly to Kritters, by bouncing onto a Krash's head. Some Krashes sit idly at the start of a track railing, and the Kongs can jump on the Krash to hijack its Mine Cart and resume riding on the tracks. In the Game Boy Advance port, Krashes were recolored from green to a light purple color. In Donkey Kong 64, Krashes appear in the Mine Cart Rides where they ride on a track adjacent to the Kongs. Krashes were redesigned to look more muscular (somewhat resembling Klubba from Donkey Kong Country 2: Diddy's Kong Quest), and their new design visually distinguishes them from Kritters. Each Krash is wielding a club, which they attempt to whack the active Kong with. The Kong can avoid being hit by jumping over the club. If the Kongs are hit, they lose three of their collected coins. Krashes can be defeated if they run into a solid formation, such as a pile of rocks, or by falling down into a pit. The active Kong must usually pull a lever to allow one of these things to defeat Krash. A scene where a Krash is behind the Kongs; it always drives the opposite direction in-game. Though Krashes never directly appeared on the Donkey Kong Country animated series, some episodes have Kritters riding around on minecarts, effectively making a Krash in a sense. Similarly, in Donkey Kong Barrel Blast, when Kritter hops into a minecart, he resembles a Krash. This page was last edited on April 2, 2019, at 15:51.